Bursting with insights and recipes from an unprecedented collection of America’s leading culinary authorities, THE NEW AMERICAN CHEF is the first book to share the secrets of cooking with the vast array of global ingredients and techniques at the fingertips of today’s chefs and cooks. The “incisive, hip writing team” (Publishers Weekly) of Andrew Dornenburg and Karen Page, winners of the James Beard Award for Best Writing on Food, have brought together dozens of top chefs and cookbook authors — including Mario Batali, Rick Bayless, Daniel Boulud, Alain Ducasse, Julie Sahni, Nina Simonds, Paula Wolfert, and many others — to reveal the essence of ten popular and influential cuisines: Chinese, French, Indian, Italian, Japanese, Mexican, Moroccan, Spanish, Thai and Vietnamese. Best of all, there are more than 100 recipes to practice and savor — including Gazpacho Andaluz from Jose Andres of Jaleo, Rock Candy-Ginger Short Ribs from Michael Tong of Shun Lee Palace, and Vanilla Flan from Susan Feniger and Mary Sue Milliken of Border Grill. Throughout, Michael Donnelly’s exquisite photographs transform the book into a feast for the eyes as well as the palate. 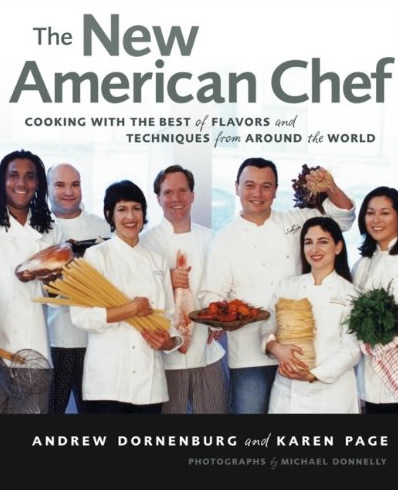 A groundbreaking book comprising a virtual around-the-world cooking school, THE NEW AMERICAN CHEF will make anyone a better cook — no matter what they’re cooking.